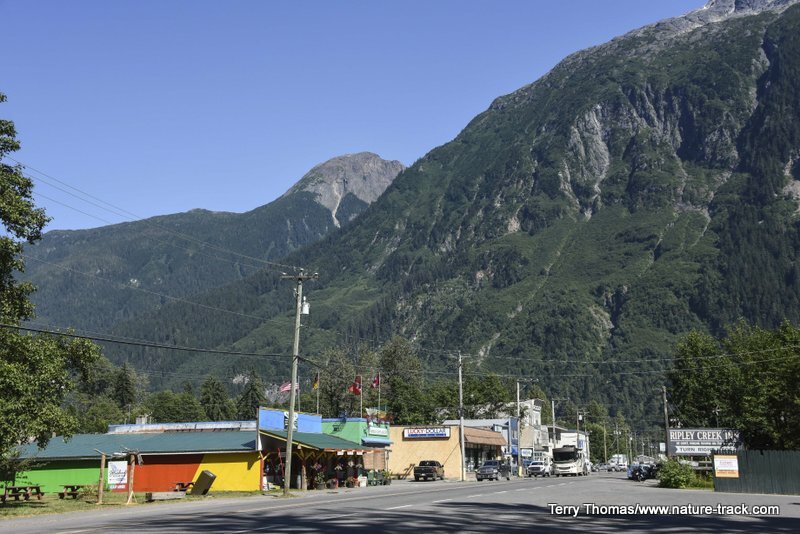 The first place you can access in Alaska when driving is a tiny town on the panhandle about 60 miles east of Ketchikan and right on the Canadian border. 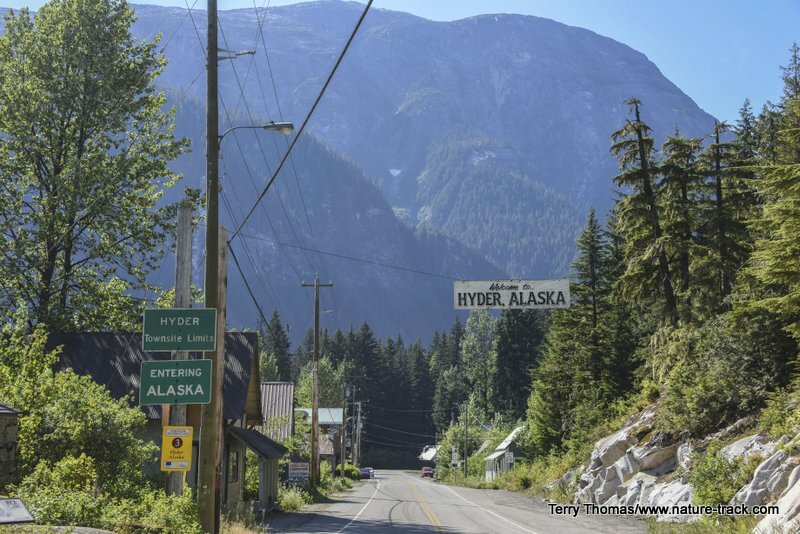 The town is named Hyder with a sister town in British Columbia named Stewart. When we left Jasper, we headed to Prince George, a surprisingly modern and thriving city of about 80,000 where we spent the night in a luxurious WalMart parking lot, which we were glad to find. We had about 15 RV neighbors that night. The next morning, we were up early, headed for Hyder. Almost 500 miles later, we made it, traveling first west on Highway 16 then eventually turning north onto Highway 37, aka, the Cassiar Highway. At Meziadin Junction, we turned west again, heading down the spectacular Highway 37A and the last 40 miles to Hyder. We saw the exceptionally beautiful Bear Glacier and many waterfalls cascading off the steep surrounding mountains. Bear Glacier on Highway 37A is awesome. Sometimes photos just don't do it justice. Hyder, a sleepy little place is best known for its bears. Grizzly and black bears converge on a small stream on the north side of town called Fish Creek. You can’t miss the signs as it is a big deal in the area. 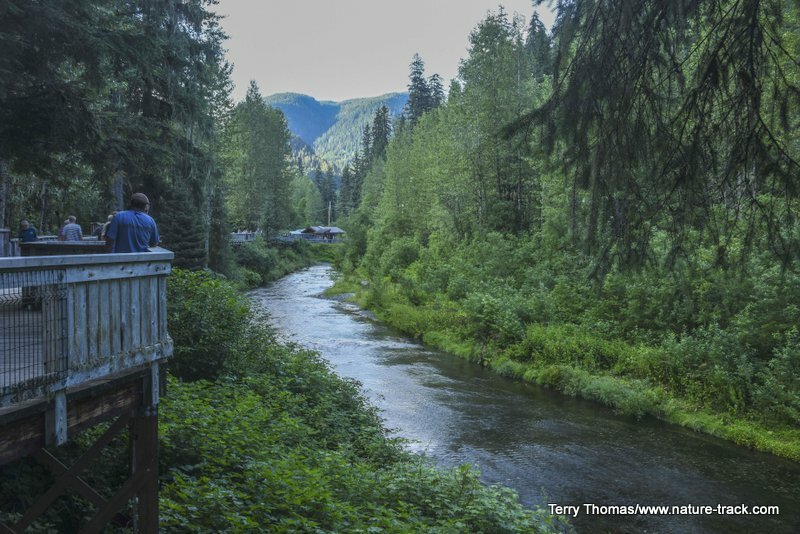 The Tongass Forest runs an interpretive center and a boardwalk/viewing area where you can watch for bears and other wildlife. It costs $5 US a day, three days for $10 or seven days for $20. Fish Creek viewing platform is a walkway about 100 yards long, possibly more. 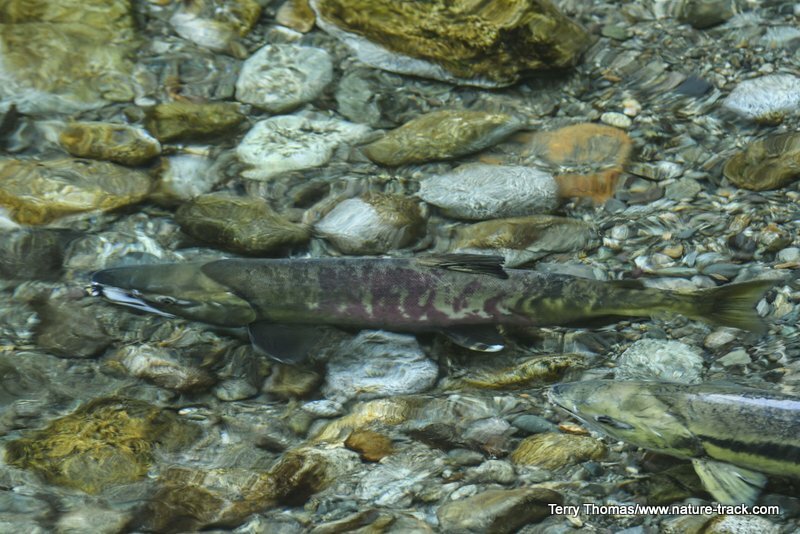 The chum salmon had arrived in numbers just the day before we got there and the river was full of them. We talked to a couple from Texas, George and Connie Harrell, who had been there for 12 days waiting for the fish and subsequently, the bears. Unfortunately for George and Connie, as well as the rest of us, the bears were taking their time in arriving. Cathy finally saw one grizzly bear while I was working on a blog in the truck, but other than that, no bears. There were hundreds of chum salmon in Fish Creek when we were there. They had completely cleaned the bottom of the entire stream, removing several inches of silt and detritus and scouring down to bedrock where they could lay their eggs. We did get to enjoy other wildlife though. Bald eagles perched in the trees overhead, swooping in to grab a fish meal every now and then. 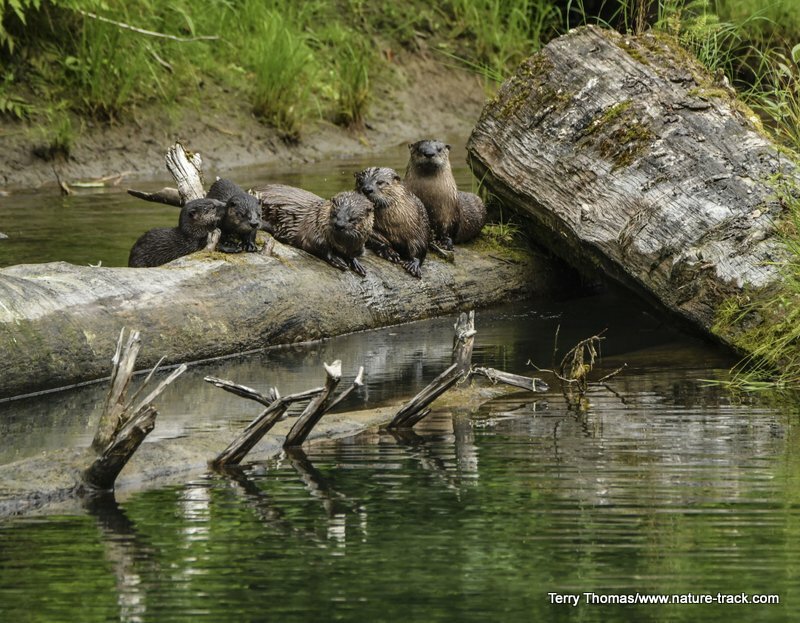 An otter family put on a show several times, a beaver industriously added to its dam and a mink would occasionally race along the bank and wrestle with salmon twice its size. We were camped in a hidden area perhaps a mile from the viewing deck, one third mile from the end of the pavement. It was an awesome place to camp and we had few neighbors. Watch carefully for a little road off to the right. When you get down the road, turn into the old gravel extraction area (it is nicer than it sounds) between the big boulders. Since the bears weren’t playing we decided to continue up the gravel road to Salmon Glacier. Within a few miles you drive back into British Columbia but there is no entry station there. The glacier is about seven miles up the road. Those in one-ton pick-ups thought the road was pretty rough but in our half-ton Ford F150, we didn’t think so. However, it is not a road for trailers and motorhomes. Salmon Glacier is cool because you are about even with the middle of the glacier instead of looking up at it. 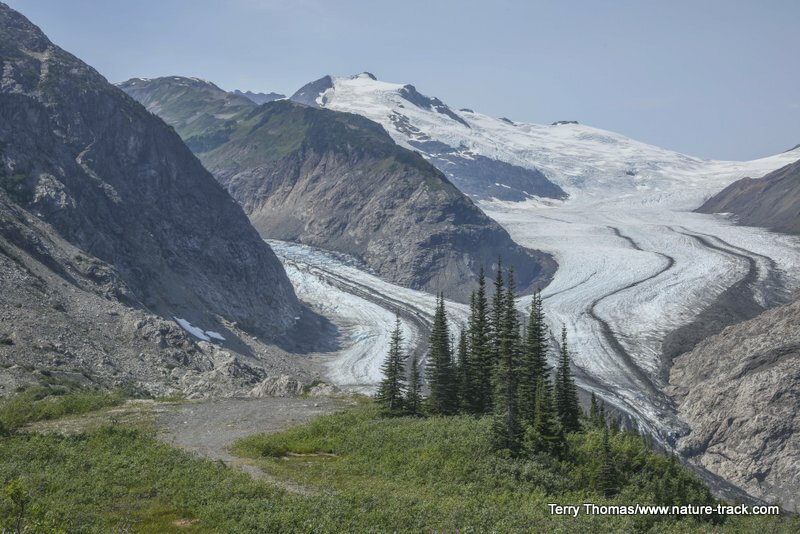 There is a side road up the gravel road about a mile that allows you to drive very close to the glacier if you are careful. Four-wheel-drive and high clearance are required though. Otherwise, you can walk down almost to the glacier. We continued up the road for about five more miles until we came to a spot where a beaver had made its dam in the middle of the road. 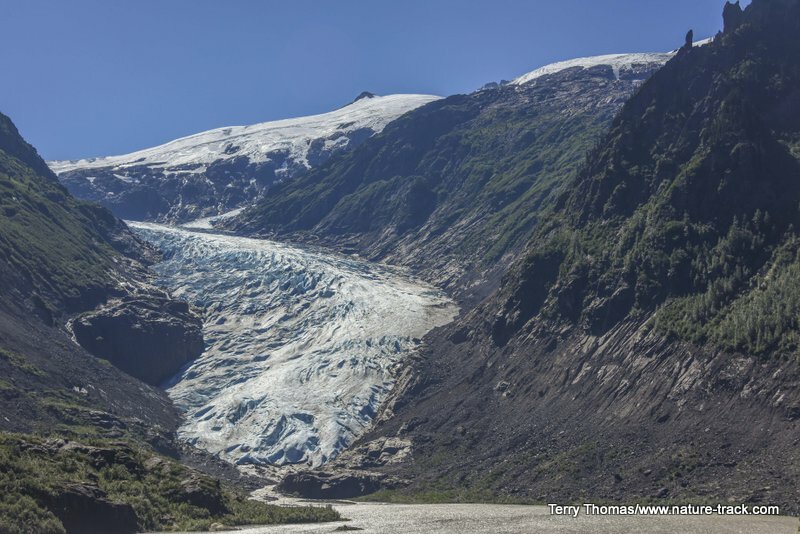 We saw a lot of mining activity and one other glacier, Berendon Glacier. Berendon Glacier above. Below, a beaver dam completely across the road. Even if the bears don’t cooperate, Hyder and Stewart are well worth the trip. 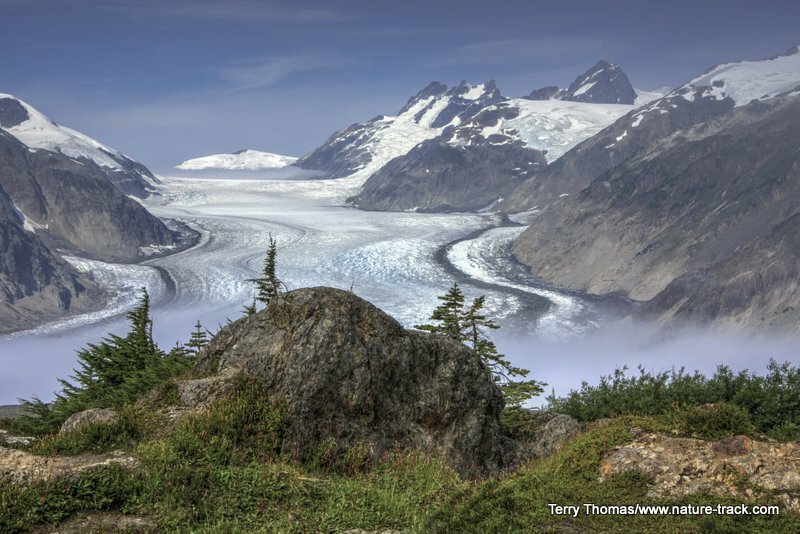 It is beautiful drive and Salmon Glacier is worth seeing. It does take you a bit off the most direct route to Tok, Alaska if you drive the Cassiar Highway, but we thought it was worth it.